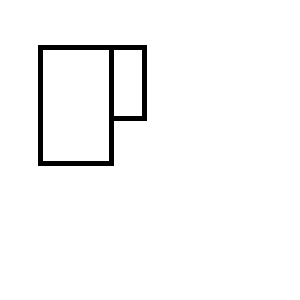 In this challenge, you are given two overlapping rectangles, and you need to calculate the rectangles created by removing one from the other. You will input the coordinates of two rectangles, A and B.
Rectangular coordinates are passed as 4 integers. You can pass them in two pairs (representing the two corner points), or as a tuple/list of 4 integers. Your inputs and outputs need to be consistent. This is a code-golf, so make your code as short as possible! EDITS: -15 from suggestions from @notjagan; another -15 by re-encoding the array of solution rectangles to int36 format and a short lookup table; another -2 by replacing product with p as per @musicman. A function that takes two rectangles, each rect being a tuple of ((left,top), (right,bottom)); returns a list of the resulting rectangles. 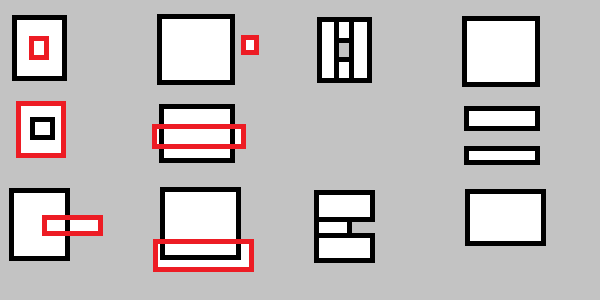 In the above diagram, the points A and B are the upper left and lower right, respectively, of the 'Source' rectangle (the first rect). 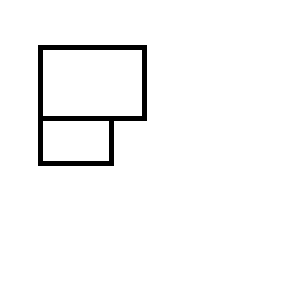 We find the placement of each of the the upper left (u,v) and lower right (x,y) of the 'Mask' rectangle in that grid. If both these points are in the first or last column; or first or last row; then there is no overlap; and we can return just the Source rect. Otherwise, there are 16 cases remaining; for example, the OP's first example is the case we can label (1,1),(2,2). Each case can be mapped to a set of resulting rectangles whose corners are always coordinates with horizontal values in either Source rectangles left,right, or the Mask rectangles left,right; and similarly for the vertical values, the Source's top,bottom or the masks. For example, for the (1,1),(2,2) case, the rectangles would be ((l,t),(T,r)) and ((l,T),(R,b)), where l,t,r,b and L,T,R,B are the left, top, right and bottom of the Source and Mask rectangles, respectively. So we can create a lookup table that maps the coordinates to the set of all such possible combinations (which is what the product(product(*zip(*))) bit is about) to a set of rectangles that should be provided for each of the cases (which, after some golfy-decompression, is what the rest of the list stuff is about). This works by testing every cell inside the first rectangle for leftness=1,aboveness=4,rightness=2,and belowness=8 w/r to the other, and ORing the result. 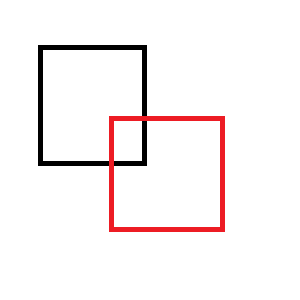 If the other does not intersect=0 with the first, then the original is returned, otherwise some combination of a left slice, right slice, upper slice and lower slice is returned, with accomodation for overlap. Not the answer you're looking for? Browse other questions tagged code-golf geometry grid set-partitions or ask your own question.